Citation Information: J Clin Invest. 2010;120(7):2528-2536. https://doi.org/10.1172/JCI41402. Total body irradiation (TBI) can induce lethal myelosuppression, due to the sensitivity of proliferating hematopoietic stem/progenitor cells (HSPCs) to ionizing radiation (IR). No effective therapy exists to mitigate the hematologic toxicities of TBI. Here, using selective and structurally distinct small molecule inhibitors of cyclin-dependent kinase 4 (CDK4) and CDK6, we have demonstrated that selective cellular quiescence increases radioresistance of human cell lines in vitro and mice in vivo. 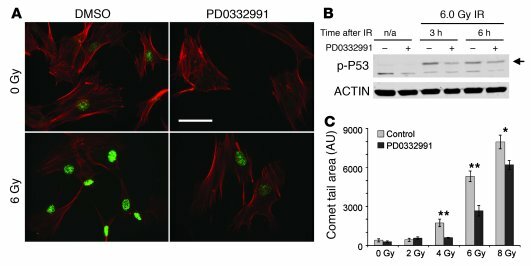 Cell lines dependent on CDK4/6 were resistant to IR and other DNA-damaging agents when treated with CDK4/6 inhibitors. In contrast, CDK4/6 inhibitors did not protect cell lines that proliferated independently of CDK4/6 activity. Treatment of wild-type mice with CDK4/6 inhibitors induced reversible pharmacological quiescence (PQ) of early HSPCs but not most other cycling cells in the bone marrow or other tissues. Selective PQ of HSPCs decreased the hematopoietic toxicity of TBI, even when the CDK4/6 inhibitor was administered several hours after TBI. Moreover, PQ at the time of administration of therapeutic IR to mice harboring autochthonous cancers reduced treatment toxicity without compromising the therapeutic tumor response. These results demonstrate an effective method to mitigate the hematopoietic toxicity of IR in mammals, which may be potentially useful after radiological disaster or as an adjuvant to anticancer therapy. PQ enhances radioresistance in vitro. (A) Images of phospho–γ-H2AX foci (green) and phalloidin staining (red) of tHDFs, with or without 6 Gy IR and 24 hours of 100 nM PD0332991 exposure. Original magnification, ×40. Scale bar: 50 μm. (B) Western blots showing phospho-p53 (p-p53; arrow) induction in tHDF lysates after 6 Gy IR, with and without PD0332991 treatment. (C) Comet tail area, after 24 hours of exposure to 100 nM PD0332991, prior to the indicated IR dose. Forty cells in each condition were imaged at an original magnification of ×20. *P < 0.01, **P < 0.0001, for pair-wise comparisons.